Famelab is a challenge issued to scientists, asking us to explain scientific concepts to the general public in only 3 minutes. Both of us – Sananda and Luca – took that challenge and participated in this year’s round of the competition in Trieste, held back in February. The design of the competition is simple: we were asked to choose two scientific topics to be presented either in Italian or English, taking no more than 3 minutes to explain each. The presenters that the judges and audience like the first time around advance get to the second round, and the top two then go on to the International Famelab competition. This chance to talk to non-scientists was a unique opportunity, one we were both excited for. Getting ready to get on stage for the competition was a process. The first challenge was to decide our topics: we had to convey scientific messages in the form of a coherent story and at the same time, thrill the audience. Of course, the preparation process and overall aim for the event were slightly differently for each of us. 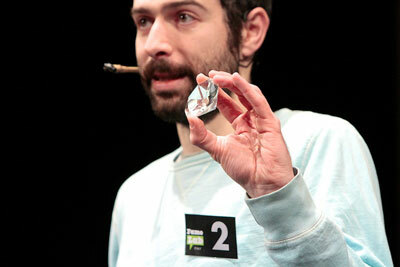 Luca participated in Famelab last year, and had developed a couple of ideas sometime back to prepare for 2016. His main objective was to explain a concept or a mechanism that the public hardly ever understood, although they observed it in their everyday life. “Science is everywhere, and most people haven’t thought about why things are the way they are.” Making them conscious of the science means they can enjoy and wonder at how things work. We both expected to have fun while increasing public awareness and understanding of science. On the eve of the show, we asked for feedback from our scientist and non-scientist friends, who encouraged us positively. Their feedback was tremendously helpful in giving final shape to our presentations. Famelab also had organized a preparatory class for all the participants a few weeks before the gala day, in which we had learned about the art of performing. The organizers gave many fruitful comments to each participant, as well as general advice about performing on stage. Between the two of us, we only have a little acting and performing background. Though being acquainted with the stage helped us to face the public, it was a different experience to get up and talk about science, not to mention trying to motivate people as well. On the day of the event, after all of our preparation, we were both selected as finalists after the first round of presentation. Hurray! “It went, more or less, as I had expected, but I was more tense at the very beginning than I anticipated,” Luca recalls. “I felt more confident during the second presentation,” For Sananda, “The first presentation went exactly the way I had expected, but I was under-prepared for the second topic and felt that it was not too strong. However, the audience was superb.” For that, part of the credit goes to the two show hosts. They were able to make the whole experience fun, setting the right mood for the audience by cracking jokes. This left the audience in a cheerful mood ready to have fun; this certainly made our jobs easier. Will we do it again if a similar opportunity comes? Of course! However, we now have a clearer idea what we would focus on while preparing: a careful selection of both the topics with each having a single take-home message, spending more time to come up with a nicely-woven story, and rehearsing over and over. All these are needed to be able to convey your thoughts in 3 minutes in an engaging and coherent way. Both of us feel that taking part in science communication is exciting and lots of fun. It is a learning process for both the presenter and the audience. Most of us, scientists, only communicate with other scientists- for work or in seminars and conferences. 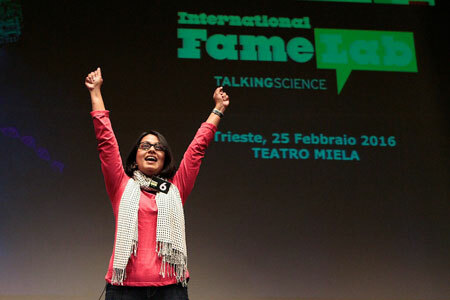 Famelab instead offers a rather unique opportunity for a scientist to share and spread scientific knowledge to the whole society. We both thank Famelab for this memorable experience! Sananda Biswas and Luca Grisanti are both post-doctoral fellows in the Condensed Matter and Statistical Physics section at ICTP.